My first completed DIY project!! I designed our save-the-date cards in MS Publisher. I will have them printed and mailed out around the end of September or beginning of October for our July 2011 wedding. I am very lucky and able to use the printing department at my work. Printing cost for 65 cards with return addresses and mailing address total $8.34. *** Since the design of our STD's our wedding colors have changed a little. We originally thought we would go with blue but ended up going more with a bluish-green / tealness. 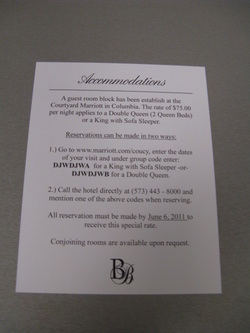 Because we have a lot of OOT guest we knew we need to include lots of information with our invites. This prompted me to looking into pocketfold invites, however the cost to purchase them was just to much. I decided that I could DIY panel pocket invites and they would work just as well. 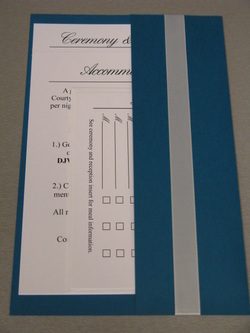 A panel pocket has a place to adhere the invite to the front and then a pocket in the back for the inserts and RSVP card. I used a single 8 1/2 x 11 piece of paper for each pocketfold purchased during Hobby Lobby's 50% of sale. I simply measured and scored each piece and then folded the extra over the back. 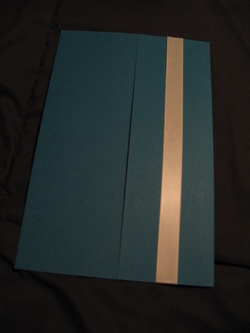 I attached the pocketfold at the top and bottom with double sided tape (worked way better than glue dots). I added a ribbon to break up the color a bit. All my wonderful inserts! 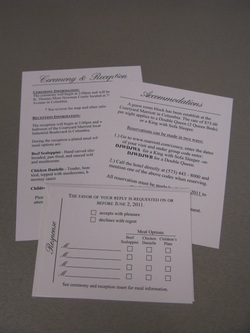 We had an RSVP card, accomodations and ceremony and reception information card. 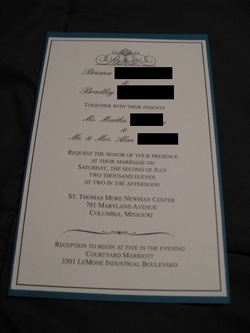 This card gives information about our ceremony and reception. It also provides information about the meal options so guest know what they are selecting. 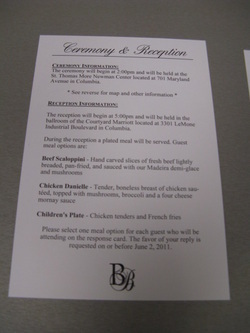 Back of ceremony and reception card. 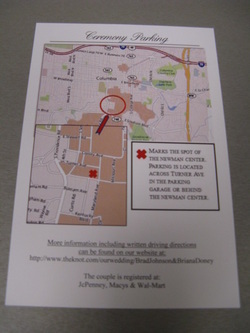 Provides a map for ceremony parking, our wedding website URL and information about our registry. Making the map . . I've had a few people ask how I created the map on the back of our invite. I used google map, the sniping tool that comes with Windows7 and PowerPoint. If you don't have Windows7 using the screenshot function and paint would work just as well to crop the area you want. Also on the invite I included the address of the church and noted that written direction were on our website and gave the address. RSVP. 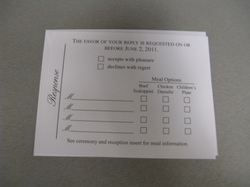 We are serving a plated meal so guest must select thier meal when they reply. Hotel information! We have lots of OOT guest. Making my own DIY invites was a great experience. I learned along the way and got better with time. In the end, I am very happy with the outcome and I hope our guest like them too. If you are thinking of doing DIY invites my biggest suggestions is to budget your time and do a mock-up. These panel pockets are easy to do but other pocket invite styles are not so easy. Make sure you don't get in over your head. 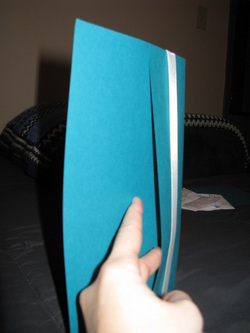 Buy just a few piece of cardstock and a few supplies . . it will save you time and money in the end if you spend the time trying it out before committing to doing it. Have fun! Mailing the invites . .
We went to the Post Office late one evening because Brad had worked late that day. We went in our PJ's and slippers and had a blast! 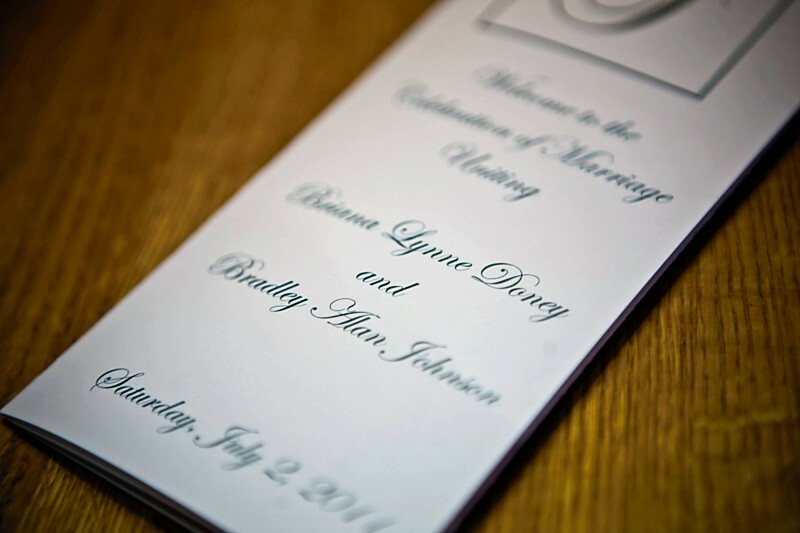 I created our ceremony programs using Publisher. It was a tri-fold single 8 1/2 by 11 piece of paper. It was simply but served its purpose. We print them on a simple white cardstock. I've included a PDF version of our completed program and a template. I've also included the Publisher file if you would like to edit it for your own use. 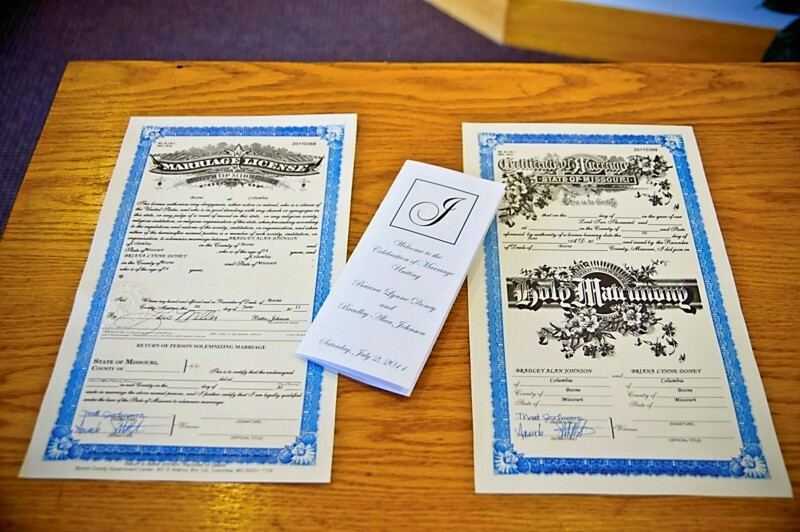 If you are planning a Catholic wedding outside of mass I suggest you take at the information I have to help make that process as easy as possible.